The issue isn’t the accuracy of the bombs you have, it’s how you use the bombs you have and more importantly, whether you ought to use bombs at all. You don’t want to be first, right? You want to be second or third. You don’t want to be – Facebook is not the first in social media. They’re the third, right? Similarly, you know, if you look at Steve Jobs’ history, he’s never been first. We need to be clear when we venerate entrepreneurs what we are venerating.They are not moral leaders. If they were moral leaders, they wouldn’t be great businessmen. There will be statues of Bill Gates across the Third World. There’s a reasonable shot that – because of his money – we will cure malaria. So, it’s a very, you know – maybe we’re wrong in – you know, we go around thinking the innovator is the person who’s first to kind of conceive of something. And maybe the innovation process continues down the line to the second and the third and the fourth entrant into a field. The great accomplishment of Jobs’s life is how effectively he put his idiosyncrasies – his petulance, his narcissism, and his rudeness – in the service of perfection. What do we tell our children? Haste makes waste. Look before you leap. Stop and think. Don’t judge a book by its cover. We believe that we are always better off gathering as much information as possible and spending as much time as possible in deliberation. Does that mean we should give up? Probably. But there are two issues worth considering. The first is – is it really true that drugs destroy the integrity of the game? An aggressive drug-testing program would cut down on certain abuses, but its never going to catch everyone – or even close to everyone. 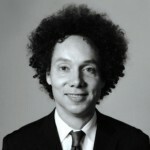 Malcolm T. Gladwell is a Canadian journalist, bestselling author, and speaker. He has been a staff writer for The New Yorker since 1996. Gladwell's books and articles often deal with the unexpected implications of research in the social sciences and make frequent and extended use of academic work, particularly in the areas of sociology, psychology, and social psychology. Gladwell was appointed to the Order of Canada on June 30, 2011.